Welcome back to another edition of Kickstart This, FirstShowing's weekly column dedicated to spreading the word about indie projects around the world that need your help to become a reality. This week, we wanted to highlight a cool project called Prospect, a short science fiction film with a homegrown vibe to it that's set on a strange alien planet. Most of the costumes are custom built, and while this may not be as slick or sleek as some sci-fi you've seen, it has a believable, lived-in feel to it. Take a look at their pitch, sound off in the comments below, and don't forget to toss these filmmakers a few bucks if you can. Check this out! Inspired by the California Gold Rush, the story of Prospect follows a young girl and her father as they go on a mission to track down a valuable resin produced by a specific breed of insect, which has become necessary to their survival on their home world. But when the girl's father is attacked by a bandit, it's up to her to avenge him. It's a coming-of-age story that takes a page out of Sergio Leone's spaghetti westerns, but what really sets this project apart is the terrific location and professional-quality design work they've done on their costumes (many of which they're giving away as rewards for donations - see the pledge rewards here). 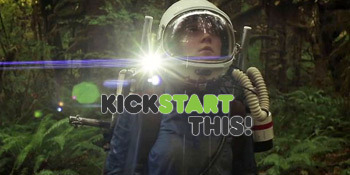 For more information on Prospect, or to help fund the project, visit its Kickstarter page. Co-directors Zeek Earl and Chris Caldwell are looking to raise $18,000 by Saturday, December 8th, and they need your help to make that happen. Please support them if you can, but if you're all out of cash, maybe you could help them out by spreading the word on Facebook, Twitter, Google+, or wherever else you can. That's all for this latest edition of Kickstart This. We've had an amazing response lately with e-mails and suggestions, so please continue to send in projects you think are worthwhile and might need a little boost. Leave us a comment, or to reach me directly, send an e-mail to: BenPears85@gmail.com. My personal inbox is always open, and if you send in a Kickstarter or IndieGoGo film project, I promise I'll always take a look at it. I want to thank you guys for supporting these projects, because they definitely couldn't exist without without the help of film lovers like you. For our complete Kickstart This archive of past projects, visit here. That dude petting the cat is absurd. I'm a huge cat nerd, but come on. Looks Amazing. My kind of movie. I want to see these guys take off!! !